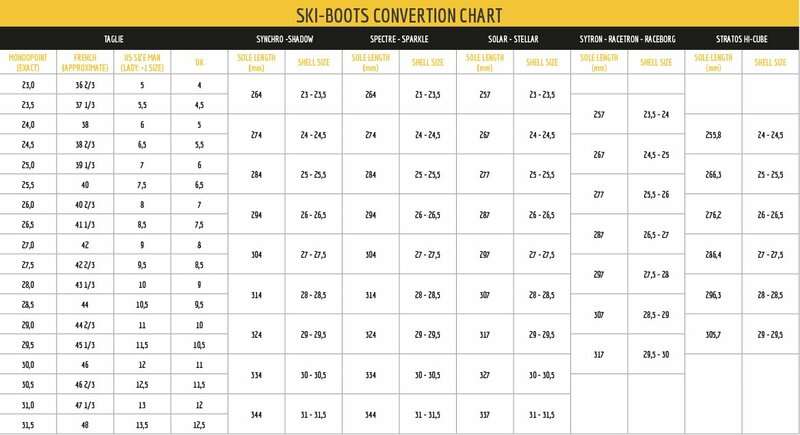 Downhill, the transmission of power and control of the ski is accentuated by the use with the TR2 safety binding, thanks to the perfect compatibility guaranteed by the Skitrab system with which it is sufficient to remove the two metal features. The shell is made of lightweight and durable Grilamid while the patented Vertebra Technology ™ loaded carbon locking system, is a structural part of the boot and facilitates the transmission of power in the downhill phase thanks to the exceptional "125-Flex" qualities of flexibility. The mobility of the shell equal to 60 ° of the total excursion, together with the accentuated gliding and the system patented EZ Flex ™ system of the innerboot, accentuate the walkability of the product, usable also for technical passages on rocks and slippery surfaces thanks to the full Vibram dual mix/double density outsole. The unique triple compatibility with TECH race bindings, AT and Trab TR2 bindings, allows for unprecedented versatility. A revolutionary evolution for lovers of powder.